Geologist Laura Grace Beckerman talks to a teen after her café on the geology of Mars. Boulder’s March Café featured Laura Grace Beckerman, a Ph.D. candidate in Geology, who studies Mars’ environment. Laura Grace does her research in Costa Rica and Nicaragua where she examines places that may share similar histories and characteristics to places on Mars. Is there anywhere on Earth like Mars? Students learned about the field of planetary geology, why we look for these “terrestrial analog” sites, how they can help us understand Mars’ past and present, and how they can inform the search for life on Mars. She thoroughly explained her trip to Costa Rica throughout the presentation. She visited a variety of locations where specific species of bacteria were found to be able to live in “extreme conditions”. For example, she explained how in one area, close to a volcano where the habitat was very hot and acidic, a population of bacteria was thriving because of the local phosphorus deposit. Her talk summarized the importance of examining such extreme environments and how they may translate to understanding the climates on other planets and other geographic locations on Earth. “When I started at Northwestern University, I knew that I wanted the background to pursue graduate school in astrobiology, but was unsure which major(s) to pursue as an undergraduate to reach that goal. I decided to take Earth 107 to test out the Earth and Planetary Sciences (EPBeckerman on field tripS) department, and I fell in love with geology. Eager to learn more, I met with Prof. Donna Jurdy after class. After kayaking down the Chicago River with the EPS department in September 2010, I was convinced that this was where I belonged, and I officially declared a second major. Over the course of my sophomore year, I realized that my biology major would not permit me the flexibility to take the classes most relevant to my interest in astrobiology. With the guidance and support of Professors Jurdy and Hurtgen, I designed an ad hoc major in astrobiology that focused on a geochemical perspective to the field. After a great summer working with stable isotopes at NASA Goddard Space Flight Center, I started working on sulfur isotope geochemistry in Prof. Hurtgen’s laboratory. I also started a work-study job with Prof. Beddows in preparation for the upcoming departmental move from Locy to the Tech infill. By the end of the year, I knew every professor, graduate student, and undergraduate major in the department, and the department had become my second family. Our activity for this Café was a modified show and tell. As students entered the room where the cafe is held, they were presented with a scattering of small tables that each had 3 or so unlabeled rocks and/or minerals on them. On each table was a prompt that read, “What do you observe? Use as many of your senses as you can to describe these specimens and write your observations on a sticky note and leave it next to the specimen.” So students circulated around the tables before the Café started and youth leaders helped encourage students to make observations. One of the rocks was labeled “Poisonous! Don’t touch or lick!” and this got lots of attention. Before students sat down, we asked everyone to grab a pile of the notes with observations on them and to remember which specimen those notes were associated with. 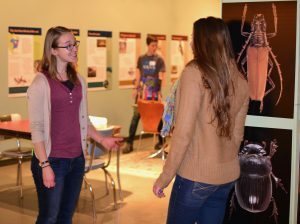 Once the presentation started, Laura Grace referred to the various specimens in her talk. When she would address one of them, she would ask a student to read the observations on their notes and she used these to get people guessing about either the identification of the specimen, some aspect of its formation, or its probable location. It was an easy way to get attendees interacting, and they seemed to enjoy the free form observation activity.